Some Dallas County Democrats just need to win their runoffs on May 22. 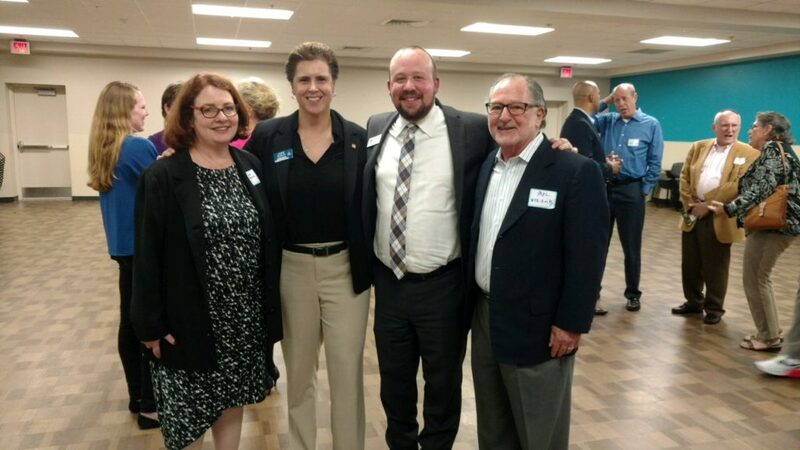 Incumbent judges Carl Ginsberg, Martin Hoffman and Ken Tapscott made the case for their re-election to the bench at a forum hosted by North Texas Jewish Democratic Council (NTJDC) on April 23. While the incumbents were not popular enough with voters to avoid the runoffs, they argued they are more qualified than their runoff opponents, Bridgett Whitmore, Kim Brown and Paula Rosales. Voters have returned them to the bench multiple times, and Republicans do not field candidates against them. The eventual nominee faces no Republican opposition in the fall. Other Democrats at the forum are not as lucky to avoid general election opponents. But they know that. Like Democrats around the country since the election of President Donald Trump in 2016, they are anxious to take on Republicans. Among those in attendance was gubernatorial candidate Andrew White of Houston, who is seeking the party’s nomination to take on incumbent Gov. Greg Abbott. 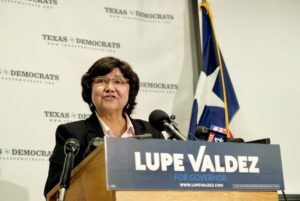 He faces Dallas County Sheriff Lupe Valdez for the nomination. The race is an uphill climb even to the most optimistic Democrat. But White thinks “common sense” Democrats like him have a chance by steering clear of divisive social issues and instead focusing on the nuts and bolts of government. Valdez was not in attendance. Down the ballot, four candidates seeking to take on Republicans running for Congress said they would love the audience’s votes. But they will completely support the eventual victor. Collin Allred and Lillian Salerno are seeking to take on incumbent Congressman Pete Sessions, a longtime Republican from Dallas. Sessions did not face a Democrat in 2016. But the party is bullish that Sessions is vulnerable. Democratic presidential nominee Hillary Clinton narrowly won the district. Allred and Salerano defeated five other candidates in the March 6 primary. Former Congressman Martin Frost, who is Jewish and whom Sessions defeated in 2004, has endorsed Allred. Both are from the district and worked in President Barack Obama’s administration. Both agreed that, whoever wins the runoff, Sessions should not be re-elected. “Our democracy is at risk,” Salerno said, with Republicans like Sessions and Trump. Lorie Burch and Sam Johnson are seeking an open congressional seat in Collin County — ironically being vacated by longtime Republican Rep. Sam Johnson. One of them will face Republican Van Taylor, a state senator, in the fall. “People are hungry for leadership,” said Burch, a lawyer whose wife is Jewish. She has spent months talking to voters and listening to their issues. Voters want a problem solver who sees all perspectives. “You can protect life and support reproductive rights. You can love God and believe in lesbian, gay, bisexual and transgender rights,” she said. Johnson, who is Jewish, has been involved in politics for as long as he remembers. Democrats are independent thinkers. Taylor is a conservative partisan, he said. Both pledged to support the eventual nominee. Audience questions took on issues most important to Democrats, including expanding access to health care, reforming the redistricting process and perceived Democratic weakness on Israel. “Democrats are not weak on Israel. That is a Republican fallacy,” Johnson said. In fact, Allred noted he was at the American Israel Political Action Committee annual Dallas dinner the previous evening. But Democrats admitted they cannot rely on their party’s enthusiasm alone in their races. They need Republicans to cross over and vote for them, too. Rabbi Neil Katz is an independent candidate running against a hard-right state representative in East Texas. He is neither a Democrat nor a Republican. But he spoke to the crowd, too. He is taking on Rep. Matt Schaefer, R-Tyler, and leader of the Texas House Freedom Caucus. Polling shows Schaefer is vulnerable to an independent challenger. But his case is different from the other candidates. Without a Democrat on the ballot, he needs Democrats and Republicans to cross over and vote for him in November. Common sense candidates need to win in the fall, he said. They just need Republicans to agree. After Sheriff Valdez, candidates in the following races will also speak. Janice Schwarz is a Jewish Democrat. But unlike some, the longtime Dallas Democratic activist is proud to say it. About 70 percent of Jews voted for former President Obama in 2012. 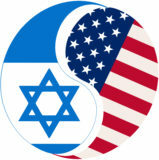 Around 64 percent of Jews say they are Democrats, according to the Pew Research Center’s 2014 Religious Landscape Study. Yet Jewish Republicans tend to be more outspoken about their partisan identity. “They paint Jewish Democrats as anti-Israel, which they are not,” Schwarz said. The North Texas Jewish Democratic Council, which kicked off Oct. 29 at the home of Bob Franklin and Lenna Webb, seeks to make more people become like Schwarz, or at least get more Jews involved in local and state Democratic politics. It is not that Jews are not active in politics. But currently no Democratic Jewish officials serve at the state level. In fact, in the last cycle former Far North Richardson Democrats President Laura Irvin tried when she ran and lost against Koop. It was believed to be the only general election race featuring two Jewish candidates from both parties. Irvin has since moved to Ohio. While that group includes a number of Jewish members, this club is different: a club created by and for Jews. (Schwarz said they would not turn away non-Jews, however.) So there is another goal: increasing the local dearth of Jewish Democratic officials. Plenty attended the event, including judges Carl Ginsberg and Mark Greenberg. Two candidates for office attended as well: Sam Johnson, who is running to succeed retiring Republican U.S. Rep. Sam Johnson (who is not related), and Bruce Chaput, who is running for an open seat in the state Senate. Both districts are in reliably red Collin County. The candidates expect an uphill battle. But the candidates may have some help from a former Republican in the NTJDC leadership. Larry Strauss left the party after strong disagreements with President Donald Trump. With the help of his friend and Democratic activist Warren Harmel and the Dallas County Democratic Party, the duo met Schwarz. 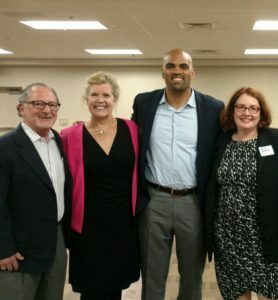 “After the Republican Party, with a majority in both houses, had no plan in place and failed to unite in repealing and replacing Obamacare, I was so disgusted, I called the Dallas County Democratic Party and the North Texas Democratic Council was born,” Strauss said. The club is the first of its kind in the region. Another prominent Jewish Democrat, Marc Stanley of Dallas, spoke about his new group. The Jewish Democratic Council of America was launched in July after President Donald Trump refused to denounce a white supremacist rally in Charlottesville, Virginia, which left one person dead. The group succeeds the now defunct National Jewish Democratic Council. Stanley and former U.S. Rep. Martin Frost of Dallas served on that board until it folded this past year. Stanley, a council member of the U.S. Holocaust Memorial Museum and chairman of the Legacy Senior Communities, spoke about the JDCA’s goals. Stanley also told the gathering about the importance of mobilizing Jewish Democrats to impact the 2018 and 2020 elections and influence local and state elections. They have reason to be interested. Statewide, Democrats consider a majority of the Republicans in the Dallas County delegation to the legislature top targets. Along with Linda Koop, Democrats are targeting Reps. Jason Villalba of Dallas, Rodney Anderson of Grand Prairie, Matt Rinaldi of Irving and Morgan Meyer of Highland Park. Republican State Sen. Don Huffines of Highland Park is also seen as vulnerable. One opportunity under consideration is a candidate forum for competitive districts like Congressional District 32, represented by U.S. Rep. Pete Sessions. Democrats see the Dallas Republican, who defeated Frost, as a top target this cycle. Democratic candidate for president Hillary Clinton narrowly carried the district. “It’s important to have Jewish Democratic representation. Democrats represent Jewish values,” Schwarz said. They just need to get involved. Contact Janice Schwarz at tamsterbath@gmail.com or 214-460-7283 for questions about the local group.